Several recent tragedies have underscored flaws and falsehoods inherent in gun control efforts in the U.S. The first is the horrific murder of four Marines and a Navy sailor in Chattanooga, Tennessee, by Kuwaiti-born Mohammad Youssef Abdulazeez. Abdulazeez first attacked an Armed Forces recruiting center and then a Navy and Marine reserve center. 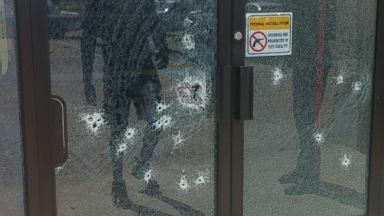 A sign on the door of the first location reads “Federal Installation – Firearms Are Prohibited In This Facility.” Photos now show that door riddled with bullet holes. Another recent tragedy revealed a major flaw in background checks. Back in June, Dylann Roof went in to an historic Charleston, South Carolina black church and opened fire, killing nine people in the church. Authorities described the horrific shooting by Roof, a 21-year-old white man, as a hate crime. In the weeks following the Charleston massacre, the FBI revealed that Roof should not have been able to purchase the gun he used. USA Today called it “an extraordinary acknowledgement of cascading bureaucratic failures” by the FBI Director. A records breakdown caused the gun purchase background check to miss an arrest on felony drug charges. Because Roof had admitted to drug possession, it would have triggered an immediate denial. This tragic failure of background checks now joins other major background check failures like the 2011 shooting of former Congresswoman Gabby Giffords and the 2007 Viginia Tech shooting where 32 people were killed. The gunmen in those shootings had also passed background checks. There was prior evidence that Gabby Giffords’ shooter was mentally unstable and the Virginia Tech shooter had been “deemed mentally ill by a judge,” and yet both were still able to pass background checks. As a convicted felon and illegal immigrant, it was illegal for the accused murderer to have a gun in his possession – even if he wasn’t the one who stole the gun from the federal agent. And yet he had one, and he now stands charged of using it to murder Kate Steinle. These gun control flaws and failures come against the backdrop of more Americans choosing to arm themselves and dropping crime rates. A new study by the Crime Prevention Research Center (CPRC) reports “the number of concealed handgun permits has soared, growing from 4.6 million in 2007 to over 12.8 million [in 2015].” The same report notes this 178% increase in concealed handgun permits has been accompanied by a 25% drop in the murder rate and a 25% drop in the overall violent crime rate during the same time period. Here in Oregon, the number of concealed handgun licenses (CHL) is up and we have a low homicide rate. The CPRC reports there are now 211,223 Oregonians who have a CHL. That’s 1 in 14 adults in Oregon who can legally carry a concealed firearm – placing Oregon well within the top half of states with the most CHLs per adult. Yet we have what The Oregonian says is a homicide rate that is “around half the national rate.” Guns in the hands of law-abiding citizens are not the problem. The solution to preventing future tragedies isn’t more flawed gun control. As a nation and as a state, we need to focus on things that can make a difference. That should include better detection and treatment of mental illness and drug abuse, as well as tougher sentencing to keep innocent people safe from criminals. UPDATE (7-26-2015): The Louisiana theater shooting happened after I’d submitted this column to the Salem Statesman Journal. It is still early and it seems that information around these tragedies can be sketchy and changing early on. At this point, it looks like the Louisiana theater was a gun-free zone, the shooter had a criminal history (including an arrest for arson) and also had violent mental health issues (a judge had him involuntarily committed.) He had a restraining order taken out against him in 2008 and he was denied a concealed carry permit in 2006, and yet he still passed a background check last year when he legally purchased the gun he used in the theater shooting. All of which sadly validates points made in my column.